Can you survive the continuous onslaught of paper soldier fodder? Maybe this a clever ad campaign to stand out more in a crowded industry, but in this day and age you usually don’t want negativity a talking point for your title. That being said, Paper Wars: Cannon Fodder has now made its way over the Nintendo Switch as the ‘Devastated’ version with a few notable updates. Paper Wars: Cannon Fodder Devastated is an updated version of the original Paper Wars with updated graphics and two new campaigns, each with three difficulties you can choose from with their own challenges. A Survival mode is included for each of the campaign modes, allowing you to use the skills learned in the latter to get the most points as possible before you go over the missed unit threshold. Paper Wars is labeled as a tower defense title, but I think it has more in common with a missile command type of game than a tower defense title. Every mission is broken down into two goals: either destroy a certain number of soldiers without letting a certain number pass or to keep fighting off a certain amount of soldiers until the time has passed. There are a few different enemy types in each campaign, although they don’t really do too much different other than move at different speeds and in the same straight lines. The gameplay revolves around you manipulating a targeting reticule that you are able to move around freely on the battlefield. Once you have a spot where you want to fire, you charge up the cannon by holding the A button letting go at the right time to send a powerful blast at your opponents. The goal is to devastate as many soldiers as you can with each bomb that you shoot out from your tank in the bottom left corner of the screen. Paper Wars does its best to mix things up, but with such a simple premise it’s hard to make the gameplay unique. Even with all the powerups and items, you can use on the battlefield that can break up formations, slow enemies, call air strikes and more, it really doesn’t amount to much variation. Unfortunately, picking up powerups can be a chore considering you have to press the A button over it to use and when this is also used for firing missiles the proceedings can get out of hand. Powerups are also susceptible to being blown up by careless firing, which helps keep players engaged in what is otherwise a very simple game. For how simple the gameplay is, thankfully there are multiple difficulties in each campaign. You might want to skip the Easy setting though due to how ridiculously easy it is, it’s probably just best left for children. Even on the Medium setting, I had no problem flying through each mission with minimal issues. The only difference I could see between the difficulties was the increased speed of the enemies making it obviously much harder to survive. Where the “worst game ever” tagline may warrant some consideration is mainly in the presentation. The enemies are crudely drawn as simplistic animated stick figures and they come out on a cut-out moving piece of notebook paper. The writing is full of grammar mistakes, upside-down or backward letters and while this may be intentional, it wasn’t especially comical or funny. Even with The negativity in the presentation and aesthetic, there is actually something quite charming, especially when a little paper explosion pops up with red marks sprayed across the paper, and it’s worth pointing out the attention to details with the style of the graphics. Overall, Paper Wars: Cannon Fodder Devastated is a fun little indie title that suffices as more of a time waster than something you can really sink your teeth into. At a price point of $9.99 it’s hard to recommend unless you need a simple tower defense title that you don’t have to think too hard about. The learning curve is almost non-existent, yet for how simple it is, with a little more polish Paper Wars could have been something more memorable. 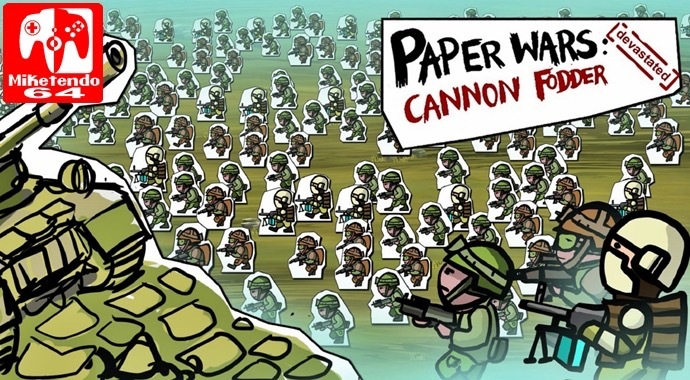 Paper Wars: Cannon Fodder may not be the “worst game ever”, but its likely not going to keep your attention for long.